Posted April 16th, 2016 by Mobile Music School & filed under Music Lessons, Percussion Lessons. Shay had a ball working with this superb bunch of happy and musically talented students in Gaelscoil na gCloch Liath. 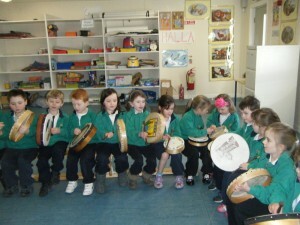 We delivered a short ‘Percussion in the Classroom’ programme to two groups of senior infants, two second class groups, one fourth class and one sixth class group. These classes worked through the 5 week short programme but over a 6 week block, as the classes were 35/ 40 mins long rather than the specified 45 mins. Junior infants were excellent at listening, and worked well over the time span. We found that the music learned in our second, fourth and sixth class groups was at a particularly high standard in comparison to what is usually covered in these lessons. For the Mobile Music School, March involved visiting schools as part of Seachtain na Gaelige. 3500km later, 11 schools thoroughly enjoyed our Lá na nDrumaí workshops. We came away from schools having strengthened our reputation and relationship with them, as well as developing it in schools we worked in for the first time. The next coming weeks involve a continuation in St Paul’s NS and in Gaelscoil an Bhradáin Feasa. April will also see us delivering a 10 week programme in Gaelscoil na Mí as well as Scoil Lorcáin, which will be based off the percussion schemes.